Booth was born in Bel Air, Maryland, into the English American theatrical Booth family. He was the illegitimate son of another famous actor, Junius Brutus Booth, an Englishman, who named Edwin after Edwin Forrest and Thomas Flynn, two of Junius' colleagues. He was the older brother of John Wilkes Booth, himself a successful actor who gained notoriety as the assassin of President Lincoln. Nora Titone, in her book My Thoughts Be Bloody, recounts how the shame and ambition of Junius Brutus Booth's three illegitimate actor sons, Junius Brutus Booth, Jr. (who never achieved the stage stardom of his two younger actor brothers), Edwin Booth, and John Wilkes Booth, spurred them to strive, as rivals, for achievement and acclaim—Edwin, a Unionist, and John Wilkes, a Confederate and the assassin of Abraham Lincoln. In early appearances, Booth usually performed alongside his father, making his stage debut as Tressel or Tressil in Colley Cibber's version of Richard III in Boston in 1849. His first appearance in New York City was in the character of Wilford in The Iron Chest, which he played at the National Theatre in Chatham Street, on the 27th of September 1850. A year later, on the illness of the father, the son took his place in the character of Richard III. After his father's death in 1852, Booth went on a worldwide tour, visiting Australia and Hawaii, and finally gaining acclaim of his own during an engagement in Sacramento, California, in 1856. 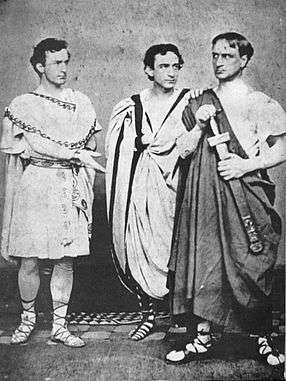 Before his brother assassinated Lincoln, Edwin had appeared with his two brothers, John Wilkes and Junius Brutus Booth Jr., in Julius Caesar in 1864. John Wilkes played Marc Antony, Edwin played Brutus, and Junius played Cassius. It was a benefit performance, and the only time that the three brothers appeared together on the same stage. The funds were used to erect a statue of William Shakespeare that still stands in Central Park just south of the Promenade. Immediately afterwards, Edwin Booth began a production of Hamlet on the same stage, which came to be known as the "hundred nights Hamlet", setting a record that lasted until John Barrymore broke the record in 1922, playing the title character for 101 performances. 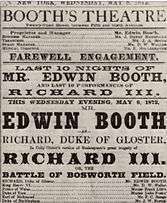 After John Wilkes Booth's assassination of President Lincoln in April 1865, the infamy associated with the Booth name forced Edwin Booth to abandon the stage for many months. Edwin, who had been feuding with John Wilkes before the assassination, disowned him afterward, refusing to have John's name spoken in his house. 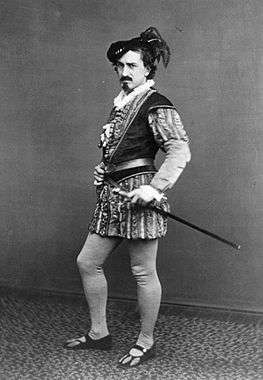 He made his return to the stage at the Winter Garden Theatre in January 1866, playing the title role in Hamlet, which would eventually become his signature role. In 1867, a fire damaged the Winter Garden Theatre, resulting in the building's subsequent demolition. Afterwards, Booth built his own theatre, an elaborate structure called Booth's Theatre in Manhattan, which opened on February 3, 1869, with a production of Romeo and Juliet starring Booth as Romeo, and Mary McVicker as Juliet. Elaborate productions followed, but the theatre never became a profitable or even stable financial venture. The panic of 1873 caused the final bankruptcy of Booth's Theatre in 1874. After the bankruptcy, Booth went on another worldwide tour, eventually regaining his fortune. In 1869, Edwin acquired his brother John's body after repeatedly writing to President Andrew Johnson pleading for it. Johnson finally released the remains, and Edwin had them buried, unmarked, in the family plot at Green Mount Cemetery in Baltimore. 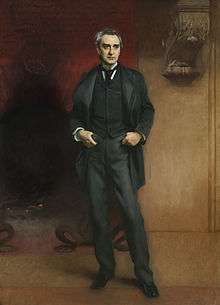 Portrait of Edwin Booth by John Singer Sargent, 1890, which hung at the Players Club. Now in the collection of the Amon Carter Museum of American Art. In 1888, Booth founded the Players' Club, for actors and others associated with the arts, and dedicated his home on Gramercy Park to it. His final performance was, fittingly, in his signature role of Hamlet, in 1891 at the Brooklyn Academy of Music. Edwin Booth had a small stroke (1891) which made his health rapidly decline after the event. On April 1893 he had another stroke which made his health worse and in the end died June 1893 at the Players', and was buried next to his first wife at Mount Auburn Cemetery in Cambridge, Massachusetts. His bedroom in the club has been kept untouched since his death. The New York Times also wrote an article of his sad departure shown here. 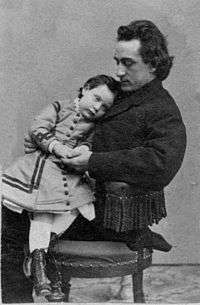 Edwin Booth saved Abraham Lincoln's son, Robert, from serious injury or even death. The incident occurred on a train platform in Jersey City, New Jersey. The exact date of the incident is uncertain, but it is believed to have taken place in late 1864 or early 1865. Robert Lincoln recalled the incident in a 1909 letter to Richard Watson Gilder, editor of The Century Magazine. Booth did not know the identity of the man whose life he had saved until some months later, when he received a letter from a friend, Colonel Adam Badeau, who was an officer on the staff of General Ulysses S. Grant. Badeau had heard the story from Robert Lincoln, who had since joined the Union Army and was also serving on Grant's staff. In the letter, Badeau gave his compliments to Booth for the heroic deed. The fact that he had saved the life of Abraham Lincoln's son was said to have been of some comfort to Edwin Booth following his brother's assassination of the president. Edwin's acting style was distinctly different from that of his father. While the senior Booth was, like his contemporaries Edmund Kean and William Charles Macready, strong and bombastic, favoring characters such as Richard III, Edwin played more naturalistically, with a quiet, more thoughtful delivery, tailored to roles like Hamlet. 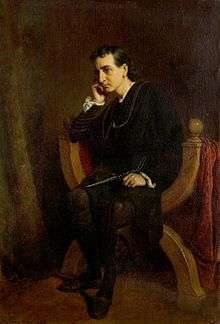 A number of modern dramatizations have been made of Edwin Booth's life, on both stage and screen. One of the best known is the 1955 film Prince of Players written by Moss Hart, based loosely on the popular book of that name by Eleanor Ruggles. It was directed by Philip Dunn and stars Richard Burton and Raymond Massey as Edwin and Junius Brutus Booth, Sr., with Charles Bickford and Eva Le Gallienne, who plays Gertrude to Burton's Hamlet. The film depicts events in Booth's life well before, and then surrounding, the assassination of Lincoln by Booth's younger brother. The Brothers BOOTH!, by W. Stuart McDowell, which focuses on the relationships of the three Booth brothers leading up to the assassination of Lincoln, was workshopped and given a series of staged readings featuring David Strathairn, David Dukes, Angela Goethals, Maryann Plunkett, and Stephen Lang at the New Harmony Project, and at The Guthrie Theatre Lab in Minneapolis, and later presented in New York at the Players' Club, the Second Stage Theatre, and the Boston Athenaeum. It was given its first fully staged professional production at the Bristol Riverside Theatre outside Philadelphia in 1992. A second play by the same name, The Brothers Booth, which focuses on "the world of the 1860s theatre and its leading family" was written by Marshell Bradley and staged in New York at the Perry Street Theatre in 2004. Austin Pendleton's play, Booth, which depicts the early years of the brothers Edwin, Junius, and John Wilkes Booth and their father, was produced off Broadway at the York Theatre, starring Frank Langella as Junius Brutus Booth, Sr. In a review, the play was called "a psychodrama about the legendary theatrical family of the 19th century" by the New York Times. Pendleton had adapted this version from his earlier work, Booth Is Back, produced at Long Wharf Theatre in New Haven, Connecticut, in the 1991-1992 season. A play by Luigi Creatore called Error of the Moon played off-Broadway on Theatre Row in New York City from August 13 to October 10, 2010. The play is a fictionalized account of Booth's life, hinging on the personal, professional, and political tensions between brothers Edwin and John Wilkes, leading up to the assassination of Lincoln. In 1959, the actor Robert McQueeney played Booth in the episode "The Man Who Loved Lincoln" on the ABC/Warner Brothers western television series, Colt .45, starring Wayde Preston as the fictitious undercover agent Christopher Colt, who in the story line is assigned to protect Booth from a death threat. In 1966, Martin Landau played Edwin Booth in the episode "This Stage of Fools" of the NBC western television series, Branded, starring Chuck Connors as Jason McCord. In the story line, McCord takes a job as the bodyguard to the actor Edwin Booth, brother of the presidential assassin, John Wilkes Booth. In 2013, Will Forte played Edwin Booth in the "Washington, D.C." episode of the Comedy Central's series, Drunk History, created by Derek Waters. In December 2010, descendants of Edwin Booth reported that they obtained permission to exhume the Shakespearean actor's body to obtain DNA samples to compare with a sample of his brother John's DNA to refute the rumor he had escaped after the assassination. However, Bree Harvey, a spokesperson from the Mount Auburn Cemetery in Cambridge, Massachusetts, where Edwin Booth is buried, denied reports that the family had contacted them and requested to exhume Edwin's body. The family hopes to obtain DNA samples from artifacts belonging to John Wilkes, or from remains such as vertebrae stored at the National Museum of Health and Medicine in Maryland. On March 30, 2013, museum spokesperson Carol Johnson announced that the family's request to exhume DNA from the vertebrae had been rejected. The Players' Club still exists in its original clubhouse at 16 Gramercy Park South in Manhattan. A statue of Booth as Hamlet, by Edmond T. Quinn, has been the centerpiece of the private Gramercy Park since 1916. It can be seen by the public through the south gate of the park. Booth left a few recordings of his voice preserved on wax cylinder. One of them can be heard on the Naxos Records set Great Historical Shakespeare Recordings and Other Miscellany. Another place to hear his preserved voice is on the site shown here [3:34] Booth's voice is barely audible with all the surface noise, but what can be deciphered reveals it to have been rich and deep. Memorials of Booth can still be found around Bel Air, Maryland. In front of the courthouse is a fountain dedicated to his memory. Inside the post office is a portrait of him. Also, his family's home, Tudor Hall, still stands and was bought in 2006 by Harford County, Maryland, to become a museum. A chamber in Mammoth Cave in Kentucky is called "Booth's Amphitheatre" - so called because Booth entertained visitors there. The Springer Opera House in Columbus, Georgia, is said to be haunted by the ghost of Edwin Booth. Broadway's Booth Theatre was the first, and remains the oldest, Broadway theatre to be named in honor of an actor. Stephen Sondheim's musical Assassins mentions Edwin in "The Ballad of Booth" with the lyrics: "Your brother made you jealous, John/You couldn't fill his shoes." Edwin Booth is a member of the American Theater Hall of Fame. 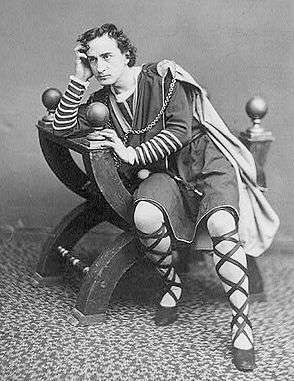 ^ Based on the description in the Library of Congress for this photo, labeled:"Edwin Booth [as] Hamlet 'to be or not to be, that is the question', CALL NUMBER: LOT 13714, no. 125 (H) [P&P]." ↑ "Map | Mount Auburn Cemetery". Mountauburn.org. Retrieved 2013-09-03. ↑ William Winter. Life and Art of Edwin Booth. MacMillan and Co., (New York, 1893) pp. 48-49. ↑ This article incorporates text from a publication now in the public domain: Chisholm, Hugh, ed. (1911). "Booth, Edwin Thomas". Encyclopædia Britannica. 4 (11th ed.). Cambridge University Press. p. 239. ↑ "Historic Photo Gallery: 1850 to 1899". www.walnutstreettheatre.org. Retrieved 2015-11-23. ↑ "Booth, Edwin (1833-1893) | The Vault at Pfaff's". pfaffs.web.lehigh.edu. Retrieved 2015-11-23. ↑ "EDWIN BOOTH IS DEAD". 7 June 1893. ↑ Charles H. Shattuck. "Shakespeare on the American Stage: From the Hallams to Edwin Booth." Educational Theatre Journal, Vol. 29, No. 4 (The Johns Hopkins University Press, Dec., 1977), p. 579. ↑ "The New Harmony Project". The New Harmony Project. Retrieved 2013-09-03. ↑ "'Brothers Booth!' Opens In Bristol". philly-archives. Retrieved 2015-11-23. ↑ "The Brothers Booth is one of Riverside's Best Premieres," John J. Buettler, The Bristol Pilot, 19 March 1992. ↑ "Brothers Booth! is a Play with Merit at the Riverside," Ken Bolinsky, Philadelphia Courier Times, 15 March 1992. ↑ Dr. Clive Swansbourne, quoted on the cover of The brothers Booth by Marshal Bradley. (Authorhouse, 2004). ↑ Ben Brantley, "Acting Up a Storm As a Stormy Actor Known for Acting Up," The New York Times, January 24, 1994. ↑ Bryan, William. "Theatre Review: The Tragedian" Charleston City Paper, 23 January 2008. ↑ "Redrawing a Picture of Lincoln's Assassin", Rachel Salz,The New York Times, 30 August 2010. ↑ ""This Stage of Fools", Branded, January 16, 1966". Internet Movie Data Base. Retrieved March 3, 2013. ↑ "Branded". Classic Television Archive. Retrieved March 3, 2013. ↑ "Brother of John Wilkes Booth to Be Exhumed". Philadelphia Inquirer. 23 December 2010. ↑ "Booth relatives want DNA testing to verify ID". Pittsburgh Post-Gazette. 23 December 2010. ↑ Edward Colimore (March 30, 2013). "Booth mystery must remain so - for now". Philadelphia Inquirer. Retrieved November 6, 2013. ↑ "Great Historical Shakespeare Recordings and a Miscellany: Henry Irving: 9789626342008: Amazon.com: Books". Amazon.com. Retrieved 2013-09-03. ↑ Booth, Edwin (1890). "Othello by Edwin Booth". Archive. Wikimedia Commons has media related to Edwin Booth. The memory palace podcast episode about Edwin Booth. "Booth, Junius Brutus". Appletons' Cyclopædia of American Biography. 1900.